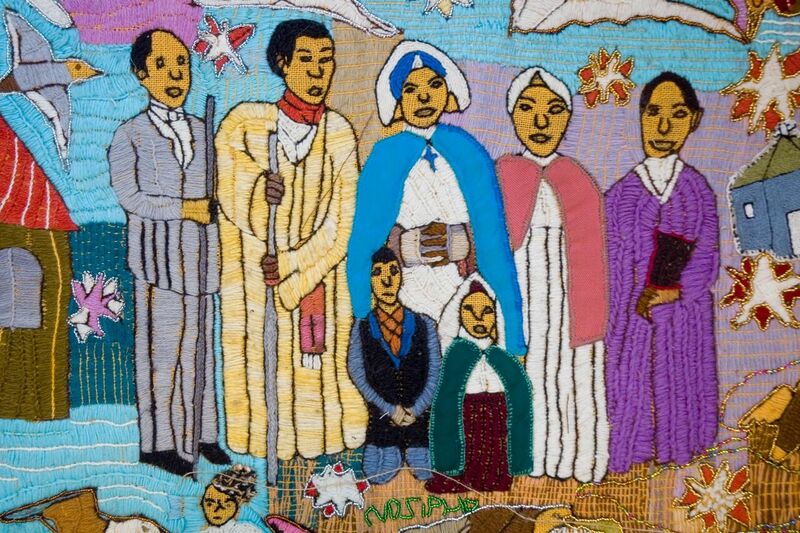 Created by about 130 Xhosa—mainly women—living along the Keiskamma River in South Africa’s Eastern Cape , the monumental Keiskamma Altarpiece is a memorial to community members who died of AIDS and a homage to the strength and agency of the women left behind. Consisting of embroidery, beadwork, wire sculpture, and photography, the altarpiece mourns loss, but more important, it prophesies hope and redemption for the village of Hamburg, providing a vision for residents to live into. The project was spearheaded by Carol Hofmeyr, a medical doctor and fine artist who moved from Johannesburg to Hamburg in 2000. Struck by the area’s high unemployment rate and lack of adequate healthcare, she established the Keiskamma Trust, an organization that sponsors dozens of community-upliftment initiatives. Wanting to improve the quality of life for her new neighbors, many of whom were infected with HIV, Hofmeyr knew that medicine, though imperative, was not all that would be needed; people must also be given a reason to live. That’s why along with running an AIDS hospice and treatment center, the Trust commissions locals to create art. This holistic approach to AIDS treatment honors both the body and the soul. The planning and making of the Keiskamma Altarpiece, for example, was an act of communal therapy; it provided an opportunity for Hamburg’s women to talk openly about AIDS and to work through their grief and confusion over the loss of loved ones or personal diagnoses as well as to ponder the role their faith plays in suffering—all while learning new skills , earning an income, and producing a thing of beauty for the world to behold. At the height of the AIDS epidemic in Hamburg in late 2004, Hofmeyr conceived the idea of creating an altarpiece modeled on the famous Isenheim Altarpiece by Matthais Grünewald, itself a response to a horrifying epidemic in sixteenth-century France known then as St. Anthony’s Fire (and today as ergotism). This disease caused arterial constriction, sores, and gangrene and killed its victims slowly and agonizingly. Grünewald was commissioned by St. Anthony’s Monastery in Isenheim, France—which functioned as a hospital specializing in treatment of the disease—to create a piece for its chapel’s high altar, an image that would provide hope and comfort to patients. He responded with a complex, multipaneled altarpiece that features biblical and extrabiblical saints known for their fortitude in the face of suffering, most prominent of which is Christ, shown as a victim of St. Anthony’s Fire. The Keiskamma Altarpiece draws on the Isenheim’s imagery of suffering, death, and resurrection but adapts it to the local context of Hamburg and its experience of the modern AIDS epidemic. In making this work the artists sought to draw a parallel between AIDS and other diseases that once seemed hopeless but that are now no longer a threat. Like Grünewald’s, the altarpiece is constructed as a series of hinged panels—fourteen in all—that open to create three different configurations. The one panel that remains constant in all three views is the predella at the bottom. This long supporting plinth depicts the funeral of Dumile Paliso, 35, echoing the Lamentation over the Dead Christ panel of Grünewald’s original. The left side of the predella shows an AIDS sufferer covered with pustules, lying in the ward where Dumile was treated. The central panel of the altarpiece in its closed view shows a Xhosa widow standing in front of a cross, mourning her husband’s death by AIDS. 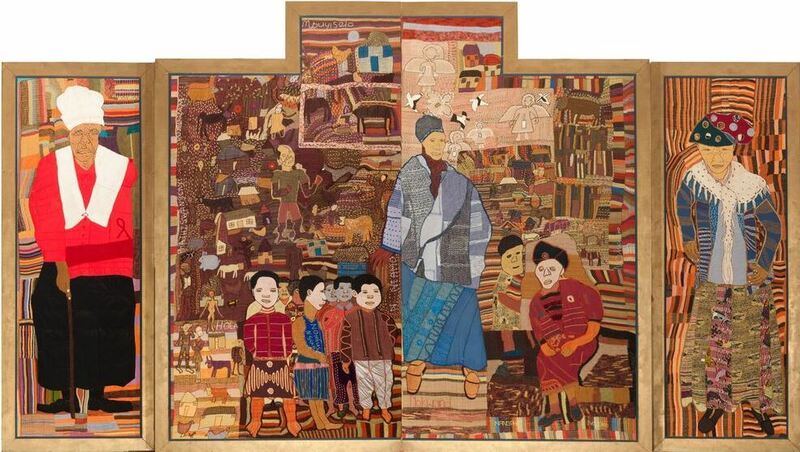 On either side of her are others who have been similarly affected—children who lost one or both parents to AIDS, and a grandmother (seated at right) who steps into this void to help raise them. AIDS is the cross they bear together as a community. While the representations in the center are meant to be generic, those on the wings are of specific figures in the community. Lagena Mapuma (now deceased ) is dressed in the red, white, and black uniform of the Methodist Women’s Prayer and Service Union ; the grandmother of a large family, many of whom are HIV-positive, she remained stalwart in the face of devastation and was a great support to those in need. On the other side is Susan Paliso, who at age 82 took on the responsibility of raising her grandson Lihle after her son Dumile died of AIDS. These elder women, pillars of the community, are pictured where Grünewald placed Saints Sebastian and Anthony the Great. The theme of new life, of deliverance, expressed by the Annunciation, Nativity, and Resurrection panels of the Isenheim Altarpiece is expressed here by a colorful vision of life without AIDS. On the left birds and butterflies—symbols of freedom and transformation—flap about over cattle-strewn pastures. On the right a vortex of fish—a traditional Christian symbol of Christ—forms around a map of Hamburg, taking the village up into another realm where suffering is no more. The center left panel shows the union of Christian and traditional Xhosa belief systems. At the top a group of people from different denominations gather outside a church for prayer and worship in the company of angels. Below them villagers gather inside a kraal to witness a bull slaughter, a multipurpose ritual that in this context connotes thanksgiving and celebration. The center right panel features a Christian man of local fame, Vuyisile Funda—known more commonly by his clan name, Gaba (“the prophet”)—who communes with God regularly before dawn by running up and down the village sand dunes, making geometric patterns with his footprints. “When I wake up I have words telling me to go down [to the beach] and worship for the day He is giving me,” Gaba says. “And after that, I give thanks by making those patterns.”  While some consider this behavior eccentric, he insists that it is his way of praying for the world and drawing attention to its beauty. Gaba is presented here as one whose vision of the New Hamburg is realized. Coincidentally, the making of this layer of panels corresponded to the large-scale introduction of antiretroviral drugs (ARVs) in Hamburg. For the first time ever, people here with AIDS were getting up and walking, eating, working, playing, giving the artists a tangible hope that infuses this section. 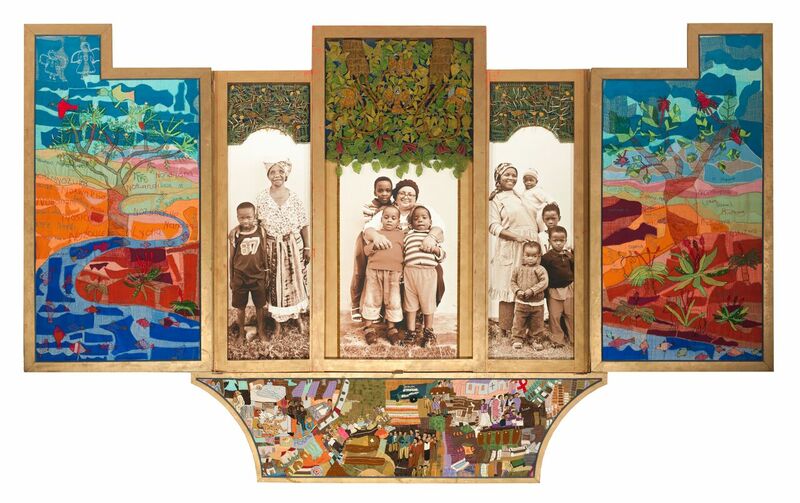 The innermost layer of the Keiskamma Altarpiece features photographs  of Susan Paliso, Eunice Mangwane, and Caroline Nyongo—local heroines of the faith who model Christ through acts of nurture and sacrifice. Shown with their grandchildren, these women replace the images of Saints Augustine, Anthony, and Jerome in the Isenheim prototype. Nyongo has five daughters and many grandchildren (only four are pictured here), all of whom live with her in Hamburg. A gifted artist, she led the group that created the wire sculpture and beadwork above the photographs in this section, which update the lime wood latticework of Grünewald’s altarpiece. Here zoomorphic emblems of the four Gospel writers—also present in the Isenheim—perch on a coral tree, and birds roost on the neighboring acacias. The outer panels feature the Keiskamma River and mountains, inscribed with the names of the artists and their relatives who have died of AIDS. This serene imagery, which echoes that of Revelation 22, indicates that the deceased community members have been laid peacefully to rest; they have entered the afterlife and are free from suffering. By using a religious format—the altarpiece—the artists have dignified their community’s experiences, have suggested that their story contains shades of the holy. It links particular Hamburg women to Christian saints of ages past who likewise endured great trials, inviting others to gaze on and follow these tangible examples of living faith. Ten years ago when the altarpiece was created, HIV carried a stigma in Hamburg, and affected individuals tended to hide any associations they had to it. The Keiskamma Altarpiece thus serves as a bold means of disclosure; it proclaims that there is no shame in the virus and moreover insists that the suffering it wreaks will one day be redeemed. The altarpiece chronicles a painful part of Hamburg’s recent past, of which the effects still linger. But it not only declares where they’ve been as a community; it declares where they’re going . . . and progress has already been made. Ten years later, the AIDS crisis in Hamburg has de-escalated; education about transmission has led to fewer new diagnoses and the birth of almost no HIV-positive children in the last seven years, and antiretroviral therapy has made living with AIDS much more manageable. Hofmeyr says that AIDS is a part of life that the community has learned to deal with and that there are many HIV-positive individuals there and elsewhere throughout the country who are well and have normal lives. The Keiskamma Altarpiece was first unveiled at the Anglican Cathedral in Grahamstown, South Africa, in July 2005. Since then it has traveled to England, Canada, and throughout the United States. It was purchased by a private collector, who has loaned it for the time being to Hamburg, where it is being housed in a government building dedicated to the arts. 1. 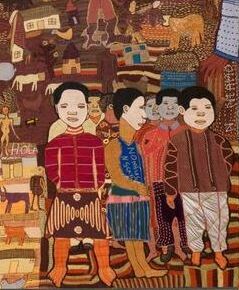 Most of the artists are from Hamburg, but some came from the neighboring villages of Bodium, Ntilini, and Bell. Of the approximately 130 people who contributed to the altarpiece, only a handful were men, including Justus Hofmeyr, Carol’s husband, who created the wooden framework. 2. 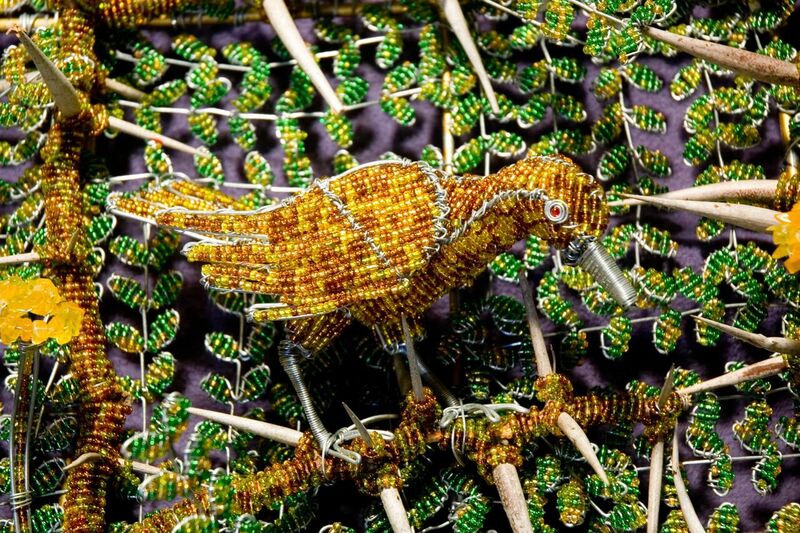 Embroidery and appliqué in the form of beading, buttons, and strips or shapes of other material were already common art forms in Xhosa society prior to the establishment of the Keiskamma Trust. But the Keiskamma Altarpiece project introduced new, related techniques to artists: Jan Chalmers and Jacky Jezweski were brought in from the UK to teach stump work, a type of raised embroidery, and Ardwork Eddie Jange from the Cape Town organization Streetwires taught them how to create three-dimensional forms using beaded wire. 3. Lagena Mapuma passed away in 2005 shortly after the altarpiece was completed. 5. In an e-mail to the author dated September 13, 2015, Hofmeyr wrote that most people in Hamburg belong to a Christian church of some kind and have deep personal faith in Jesus but also maintain traditional beliefs about ancestors, who are said to maintain relations with the living and serve as a source of good or bad fortune. For more on the interplay between the two religious systems, see B. A. Pauw, Christianity and Xhosa Tradition (Cape Town: Oxford University Press, 1975). 6. Quoted secondhand in Brenda Schmahmann, “A Framework for Recuperation: HIV/AIDS and the Keiskamma Altarpiece,” African Arts 43, no. 4 (Autumn 2010): 47. 7. Keiskamma Songbook: Aquarium (Keiskamma Trust: Hamburg, Eastern Cape, South Africa, 2010), 40. 8. Tanya Jordaan took these three photographs and worked as a supervisor on the project. 9. For more about Eunice Mangwane, see season 1, episode 16 of the SABC television documentary series I Am Woman, Leap of Faith. Keiskamma Altarpiece, 2005, mixed media, 4.15 × 6.8 m (13.6′ × 22.3′). Photos courtesy of Keiskamma Trust. Victoria Emily Jones lives in the Baltimore area in the USA, where she works as an editorial freelancer and blogs at theJesusQuestion.org. Her educational background is in journalism, English literature, and music, but her current research focuses on ways in which the visual arts can stimulate renewed theological engagement with the Bible. She is in the process of developing an online biblical art gallery, a selective collection of artworks from all eras that engage with specific texts of scripture.